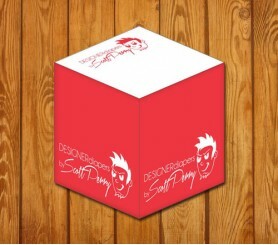 Custom printed 3.875 x 3.875 x 3.875 non-adhesive memo cubes 1 color, 1 design works for marketers and businesses of all types because people find them impressive and handy. Great for bulk gifting because marketers can receive price cuts and opportunity to get their brand information featured over the sheets. It can be offered as an acknowledgement token on all occasions because people would be happier to grab them always. We offer great savings on bulk orders of these personalized memo cubes, which makes it affordable for even small budget marketers. Request a quote to know price cuts that you can avail for wholesale customized 3.875 x 3.875 x 3.875 non-adhesive memo cubes 1 color, 1 design. * Price includes 1 standard color screen printed SPOT and 1 side design. Sheet imprints offered on orders of 250 or more.